We have been breeders since 1985 and occasionally have puppies for sale. 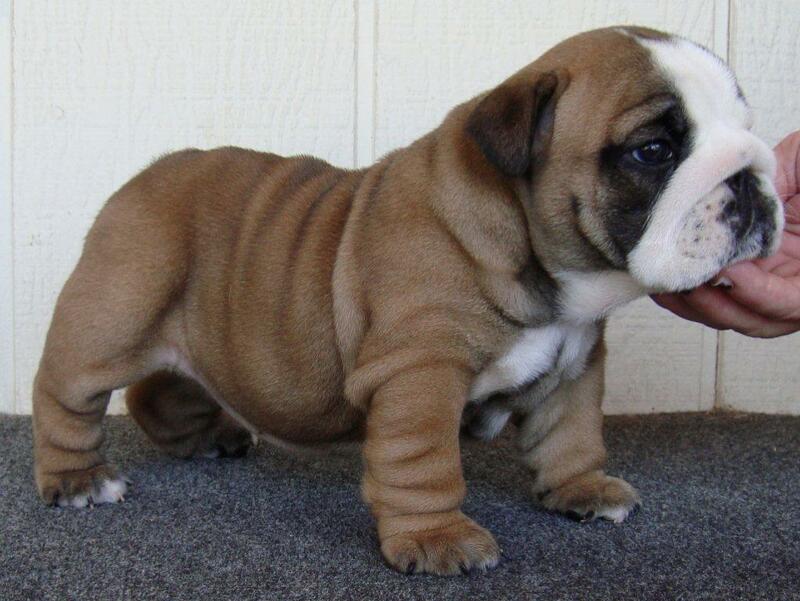 Bulldogs are known by several names, in the US most people know them as bulldogs or English bulldogs. They were originally bred for bull and bear baiting, but today's dogs are loving and gentle that are low to the ground, with wide chests, short backs and massive upturned jaws. English bulldog puppies are pretty typical, getting into everything you own, and chewing furniture. As adults they are more laid back, but still remain puppy like all their lives. They are easy to train but can be stubborn, so making them think what you want them to do was their idea makes training a whole lot easier. Please make sure this breed is for you, by doing your research. There are many English Bulldog breeders, some are very knowledgeable and caring, and some that do not care where their puppies go. Owning one of these wonderful dogs is a commitment for 10 to 12 years. The decision on whether you want a show potential or a pet quality puppy is entirely up to you. Pet quality simply means that they are not as close to the standard as a show prospect. Their ears maybe too big or their top line may not be perfect, but they will be a wonderful pet ! Sometimes show breeders have older dogs available that did not turn out to be the show dog that they had hoped for, they will make great pets, and most will have been fully vaccinated and be housebroken. Please stay away from that cute puppy in the window at the pet store, you are condemning that puppies mother to a life of misery in a puppy mill. This breed can be prone to several health problems, so doing your research will pay off. Cherry eye is very common in bulldogs. The more heavily wrinkled dogs are prone to also having problems with their eyelids rolling in. This breed will never have hips like a Labrador! They are bred to have a shuffling roll when they move, and their hip joints are considered poor by most veterinarians. Because this breed is brachycephalic (short nosed) they are very prone to heat stroke, and can overheat very easily. Breeding can be quite challenging! Artificial insemination, c-sections and caring for puppies takes a lot of time and money. If you have no desire to invest time into raising a litter, and putting that vacation on hold, do yourself a favor, spay and neuter your pet. We are Chris and Terri Cook. Located in North Western New Mexico about 45 minutes from the Colorado border. 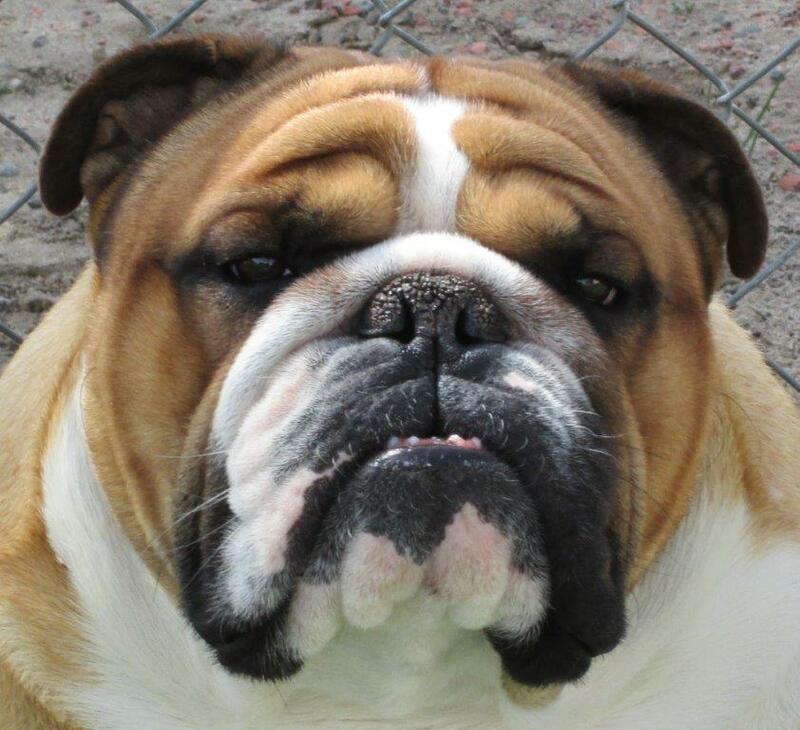 Our journey began in 1985 when we got our first English Bulldog. I asked my husband why on earth he wanted such an ugly dog! We had our first litter, and I fell in love. We started out with bloodlines from American breeders. I saw the dogs in Europe and decided to import a female from Australia. I loved the looks of the European dogs so we imported several more. The dogs we have today are descendants of those dogs. Our next litter of english bulldog puppies will be born around July/August. If you are interested in a puppy call or email and I would be happy to put you on our waiting list. No part of this website can be reproduced in any way without the written permission of the owner.